We went off to Fuel last Sunday afternoon to check out the scene. It is set in a fairly scruffy part of town. It also doubles as an evening bar/music venue. I didn’t go upstairs, but understand that’s where the music happens. 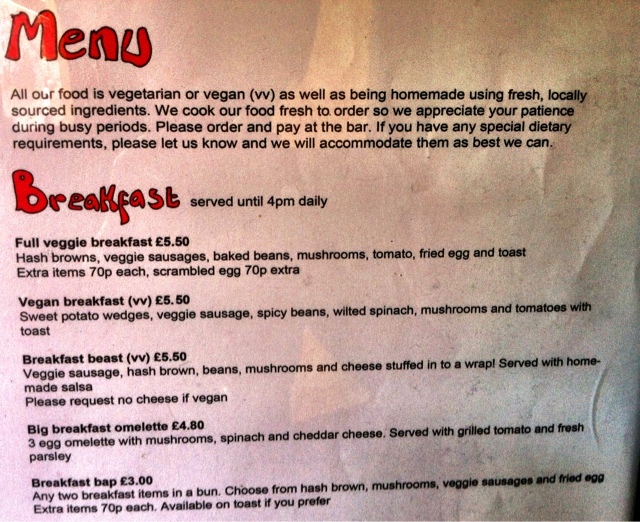 As for the food, it is vegetarian, and the menu is quite extensive. Although we could have tried one of their breakfasts as it was just about ‘brunch time’, we decided to have a starter and main course instead. 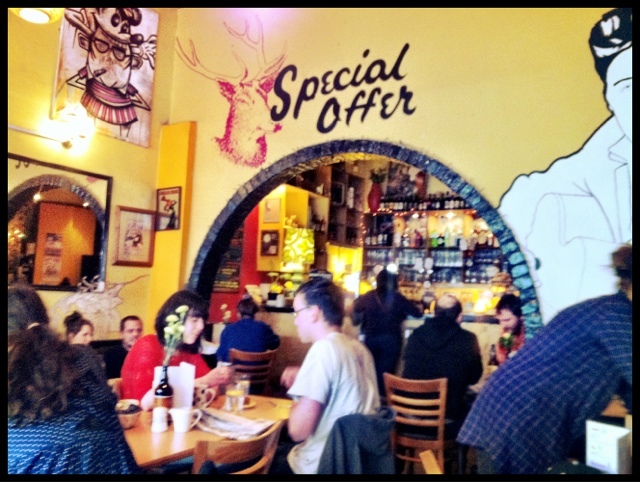 There were a few people having breakfast, which looked hearty and wholesome. My only criticism would be that too much of their food is fried … That particular day, I was in a bit of ‘chips mood’, so didn’t bother me much, but generally I don’t really like fried food much. 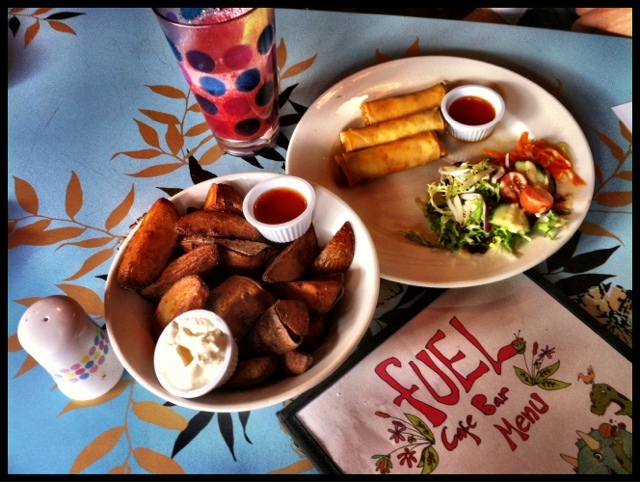 From the picture above, you would be forgiven for thinking we ordered spring rolls – as that is what they looked like. 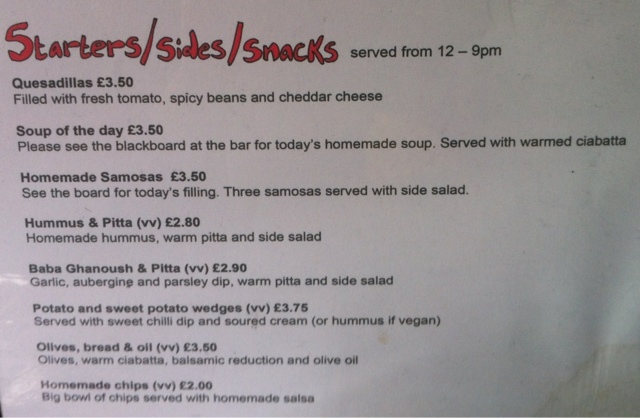 But in fact, they were Indian samoosas. Very flavoursome. The plate of chips we ordered was huge – and weren’t just potato chips, but rather a mixture of potato and sweet potato chips. Prices are pretty good though – nothing very expensive. I guess that would be because they cater mostly for students. The other interesting fact was: in spite of it being lunch time, no-one was drinking. And it certainly cannot be due to a lack of choice – because they had a good choice of beers, including Belgium beers. But I think it was due to their extensive and unusual non-alcoholic drinks menu. 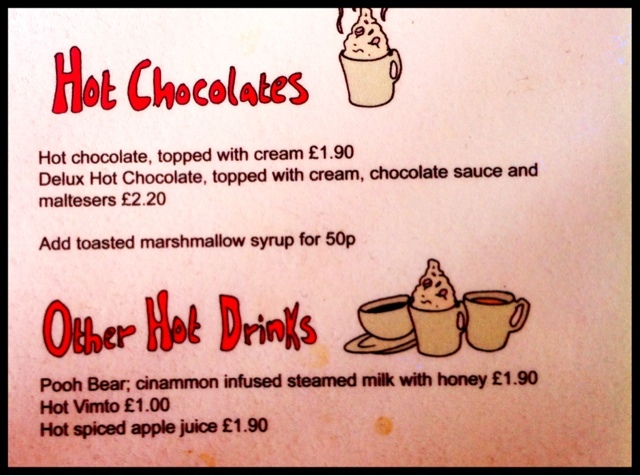 I was tempted by the Pooh Bear: Cinnamon infused steamed milk with honey, but the Hot spiced apple juice pipped it to the post! I ordered a ‘fishfinger buttie’ (but being vegetarian, it was actually a halloumi finger sandwich!) and Tim tried the falafel burger. Everything seems to be served with sweet chilli sauce, which didn’t really work with sweet potato wedges, but was lovely with my halloumi. Unfortunately Tim’s came in one of those horrible, processed burger buns, which was a bit of a let down, but mine was in pita – much better! Unfortunately there was no room for dessert, which was a little disappointing as I was looking forward to trying their waffles. I love american waffles – as apposed to Belgium waffles. For those who don’t know the difference: American waffles are made from something similar to pancake batter and they aren’t sweet at all (until you smother them in maple syrup, if that floats your boat), whereas Belgium waffles are smaller and much sweeter, and often have crystals of sugar on top, and finally topped with more sweet toppings. Making them far to sweet for me. 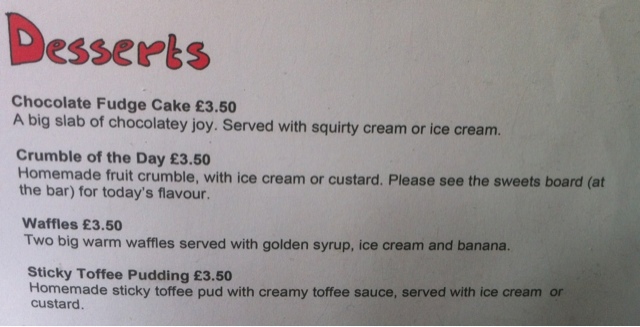 So I was rather keen to see which type of waffle was on offer. Million dollar question: would I go back? I don’t think I would make a special trip. But if I were in the area, I would pop in. To try the waffles of course. My name is Laura, I have been reading your blog and I love it! I think it's full of very interesting information for everybody who likes enjoy in differents places (like me!) So, thank you for spend your time on us. I am the event-coordinator from a restaurant in Hale and I wonder if you could be interested in make a post about our restaurant. If you are interested I can invite you when you want. 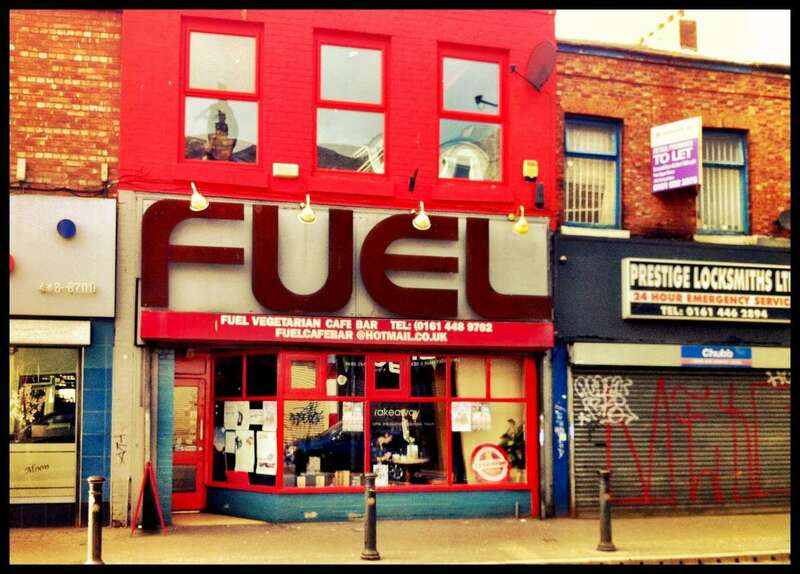 Big fan of Fuel. Last time I went I had a very pleasant afternoon of watching music acts and supping the hot apple juice that they sell. Good times.